Yes, this will be my first year as a funded rider and I am delighted to have such an amazing opportunity to follow in the footsteps of some of the worlds best over the last 20 years. My dad was a professional on the road and track in the early 1980's and I had a very keen interest in his photo albums when I was young. We were sat watching the Tour on tv one year and I told my him I wanted to give it a go. Not long after I did my first race on a Specialized Hardrock mountain bike against lads on expensive road bikes with their names on their top tubes. I think I got a good result but I wanted a road bike. The next race I had my trek 1000 road bike and I won! Ever since I have been in love with the sport and so excited to be able to continue my progression in the hope of becoming professional in the near future. In 2015, I will be doing Belgian Continental team, Team 3M. 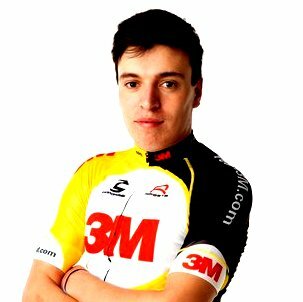 Team 3M is one of the most popular Continental teams in Belgium and focuses purely on the development of young riders. Having such a professional set up and putting their efforts in working with young riders progression, is what attracted me the most. Although Team 3M is a development team, they have a 20 man squad with ages from 19-26.For a development team, they do have a very intense race calendar which is what makes Team 3M one of the most well known Under 23 teams around. Since 2013, they have successfully lined up at one of the biggest classic's on the planet, Kuurne-Brussel-Kuurne.Following the teams motto 'Making progress possible', I hope to continue my progression and hopefully take my first win in Team 3M colours! At this moment in time I'm not 100% sure what my race calendar will look like. However, at my training camp next week hopefully I should know my early season race program. At the moment I am currently staying in Murcia (Spain) for an extra weeks training in the warmth before I travel further up north to Cambrils for a 10 day training camp with my team.When are you heading out to Europe/USA? My first race of the season will probably be on 1st March but as the team has 3 races on that day I'm not quite sure which one I will be doing. The team are currently sourcing accommodation for myself and 3 other Irish/British riders, so hopefully I will have moved to Belgium before the 1st March and settled in before the season starts.